New Batteries: Progress or Confusion? Battery technology experienced a major technology evolution in the late 1950s similar to the one that took place in the late 1990s. Prior to the 50s, most common portable batteries were of the carbon-zinc type and were not rechargeable. Nickel cadmium (NiCad) cells existed, but were not in widespread use largely because little was known about the chemistry and how it responded to various charge and discharge cycles. Mercury, NiCad, nickel metal hydride (NiMH), alkaline-manganese, began gaining popularity in applications requiring longer battery life and more consistent discharge characteristics. In the 2000s, lithium polymer (LiPo) and lithium ion (LiIon) underwent a similar evolution. 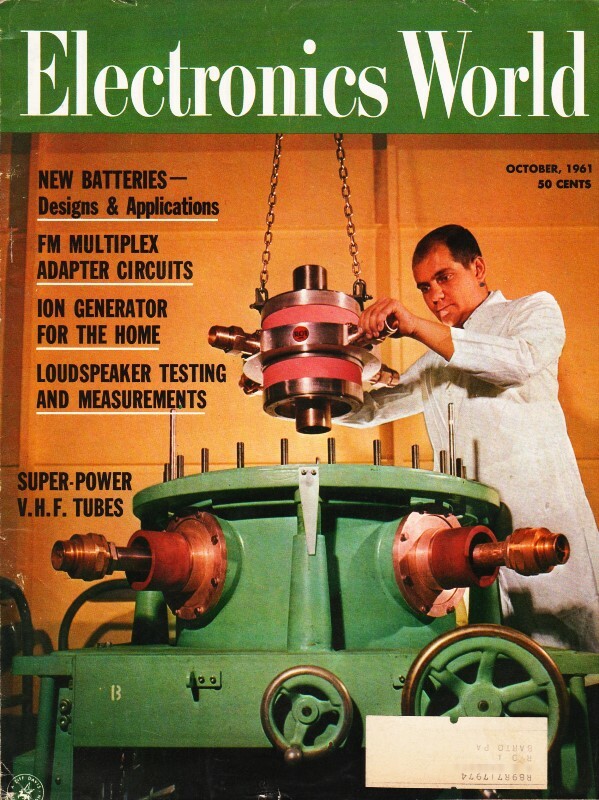 Still, all the aforementioned battery types are in use today, so this article is as relevant now as it was when published in 1961. Description, characteristics, and applications of the new alkaline-manganese and sealed nickel-cadmium types. Manager, Sales Engineering, Union Carbide Consumer Products Co. Selecting a battery for a radio or instrument is not merely a dollar-and-cents decision. Proper choice from the many types now available can have a marked effect on the operation of the device and on the user's satisfaction and convenience. Every battery type and electrochemical system offers certain advantages and limitations. A general understanding of battery characteristics can eliminate confusion and permit a wise selection. Fig. 1 - Cut-away illustration of an alkaline-manganese cell. 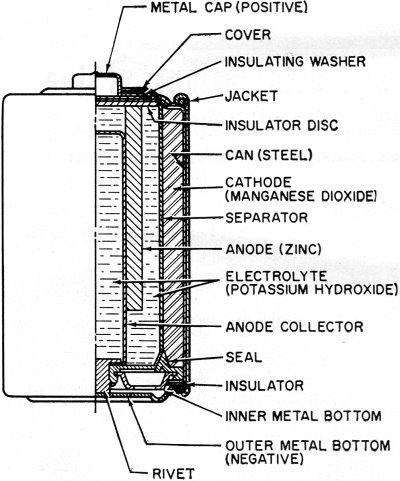 Prior to World War II, practically all primary batteries were the LeClanché or carbon-zinc type. Both flat and cylindrical cells were available, but choice of a battery for a particular use presented few problems. Wartime military requirements stimulated fantastic advances in electronics and created a need for specialized battery-power sources. Battery research and development efforts mushroomed. Efficient miniature carbon-zinc batteries became practical, and new electrochemical systems were evaluated. The mercury battery system was one result of this research. In the years since the war, these efforts have continued. The mercury battery system and miniature carbon-zinc batteries were perfected, the transistor was developed, and battery-operated devices, from toys to radios, gained wide consumer acceptance. The need for compact, efficient, economical batteries has now brought two additional electro-chemical systems into use: high-energy alkaline-manganese batteries and sealed nickel-cadmium rechargeable batteries. The owner of a pocket radio powered by penlite cells has a problem. Shall he use standard flashlight cells, radio-type carbon-zinc cells, mercury batteries, alkaline-manganese energizers, or nickel-cadmium batteries? For example, there are eight different "Eveready" brand penlite cells, each designed for a particular use. The multiplicity of battery types has caused confusion. Has there also been progress? Almost everyone, even a child, recognizes a battery and considers it a very simple device. Appearances can be deceptive. A battery is actually a small electrochemical plant. It must do nothing until power is needed and yet must start operating instantly when an electrical connection is made. It must operate in any position and withstand rough handling. A modern battery must be compact, efficient, foolproof, attractive, and economical; and it must operate under all orts of adverse conditions. Consider the characteristics that would be desirable in an ideal battery: long shelf life, high energy, good light-drain performance, efficiency on heavy-drain use, reliable intermittent operation, good continuous service, high amperage, low impedance, high-temperature stability, low-temperature capabilities, constant voltage, recharge ability, small size, freedom from leakage, attractive appearance, and last but not least, it must be inexpensive. Unfortunately, it is not yet possible to maximize all of these characteristics in a single battery. In order to supply each type of user with the. best possible battery for his particular application, a battery manufacturer must produce a number of different batteries of the same size and shape, each tailored to maximize the most essential characteristics for a specific end use. To obtain the best battery value and satisfaction, the consumer or the professional who advises and supplies him, should understand at least the basic characteristics of the new batteries now available. Carbon-zinc and mercury batteries have been in use long enough for most interested technical people to have a general appreciation of their characteristics. The carbon-zinc system is the workhorse of the industry. These batteries have the widest availability, a broad range of desirable characteristics, and the lowest initial cost. Mercury batteries provide longer life, a more constant voltage, and lower impedance - but at a higher price. What do the alkaline-manganese and nickel-cadmium batteries offer? Alkaline-manganese batteries have a total energy almost equal to mercury batteries and they are capable of delivering their rated capacity even on heavy continuous drains where both the carbon-zinc and mercury systems become inefficient. Furthermore, this newest electrochemical system provides high amperage, low impedance, outstanding temperature characteristics, and good shelf life at a price between carbon-zinc and mercury battery cost. Fig. 2 - The type E91 alkaline cell provides twice the service life obtainable from the standard penlite-type cell. The sealed nickel-cadmium system permits a maintenance-free battery that can be recharged hundreds of times and can be left discharged without damage. Unfortunately, practical areas of use are limited by high initial cost and by the fact that energy-per-charge is often much less than a primary battery can supply. A discussion of battery performance and applications will help clarify the relative merits of the alkaline-manganese and nickel-cadmium battery systems. This cell differs from the conventional LeClanché cell primarily in the highly alkaline electrolyte used. The cell is a high-rate source of electrical energy. Its outstanding advantages are derived from the unique assembly of components and construction methods. See Fig. 1. Two principal features are a manganese dioxide cathode of high density in conjunction with a steel can which serves as a cathode-current collector and a zinc anode of extra high surface area in contact with the electrolyte. These features, coupled with the use of a potassium hydroxide electrolyte of high conductivity, give these cells their very low internal resistance and impedance and high service capacity. The cells are hermetically sealed and encased in steel, providing virtually a leakproof package. Each cell is a nominal 1.5 volts. The ampere-hour capacity is relatively constant over a range of current drains and a range of discharge schedules. The primary advantage of the new system lies in its ability to work with a high degree of efficiency under continuous or heavy-duty, high-drain conditions where the standard round cell is unsatisfactory. Under certain conditions the new alka­line cells will provide more than ten times the service of standard round cells. Heavy current drains and continuous or heavy-duty usage impair the efficiency of the conventional carbon-zinc cell to the extent that only a small fraction of the built-in energy may be removed. On light drains, such as portable radio or instrument use, alkaline-manganese cells often supply more than twice the service life (Fig. 2) of carbon-zinc batteries and very nearly equal mercury battery life. The low impedance of alkaline cells can improve radio performance by minimizing distortion and their low temperature characteristics result in good serv­ice life even under outdoor winter conditions. The good low-temperature performance of alkaline-manganese batteries completely overcomes the temperature limitation of mercury batteries and far surpasses standard carbon-zinc cells. At light to intermediate drains, reasonable service can be obtained at -40 degrees F and below. This characteristic is particularly valuable in devices which may be stored or operated outdoors or in automobiles in winter. The heavy-drain, high-amperage performance of alkaline-manganese batteries makes them particularly useful in toys and for photographic and hobby use. These cells will make practical completely new types of battery-operated equipment. The E94 alkaline energizer is a new cell size. The diameter is the same as a "D" cell but it is only one-half the height. Two E94 cells will fit in a holder designed for a single "D" cell. Where it is desirable, and the device will stand the higher voltage, it is now possible to double the voltage in existing "D"-cell-powered units. The smaller alkaline cell has a service capacity equal to a standard "D" cell on heavy continuous drains. For example, four "1/2 D" cells can be placed in a standard 2-cell flashlight. If the usual PR-2 lamp is replaced by a PR-13 lamp, designed for the higher voltage, the light output will be doubled. The brilliance will approach that of a 5-cell spotlight. The E93 "C" size alkaline energizer, like the other alkaline-manganese cells, on heavy continuous drains will supply up to ten times the life of a comparable carbon-zinc flashlight cell. Its first use was in the "Futuramic II" electronic flash unit manufactured by the Heiland Division of Minneapolis-Honeywell Regulator Company. The high energy and high amperage of the alkaline energizers made them ideal for this application. Electrically powered toys are very hard on batteries because drains are heavy and the smallest possible cells are usually used. The majority of toys use "AA" or "C" size cells. The heavy drain capabilities of alkaline-manganese cells make them ideal for this use. They not only last several times as long as flashlight batteries, but they often improve toy performance as well. When currents of one ampere or more are required for periods of several hours, larger alkaline-manganese cells must be used. Both "D" and "G" size cells are available, the latter both as a unit cell and series-connected to form the 6-volt No. 520 battery. 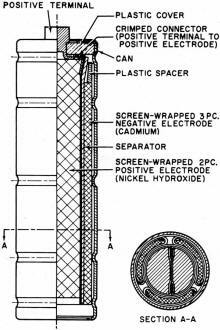 Although the "G" size cell with insulated terminals ("Eveready" No. E97S) is about one-sixth the size and one-quarter the weight of the No.6 cell used in the hobby field, it gives over 70 per-cent of the service of the No.6 cell in glo-plug ignition operation for the engines of model airplanes. In addition to electronic, toy, hobby, and other heavy-duty uses, the E95 "D" cell and the 6-volt battery (No. 520) are particularly adapted for emergency lighting use. Emergency flashlights or lanterns must be capable of supplying a bright light (high-drain bulb), they must be capable of continuous operation for the duration of the emergency (possibly many hours), and they must operate under adverse temperature conditions. Furthermore, the batteries must have a good shelf life so they will be capable of operation when an emergency occurs. These requirements spell out the important characteristics of alkaline-manganese cells. The flashlight in an automobile is an emergency light- and in winter it must be capable of operating when cold! The initial cost of alkaline-manganese batteries falls between that of carbon-zinc and mercury batteries. On all tests they deliver more service than carbon-zinc batteries and on heavy-drains or in low-temperature uses, service of alkaline-manganese batteries will exceed mercury batteries. Unless a flat discharge curve is essential, the cost-per-hour operation of alkaline-manganese cells is lower than for mercury batteries, It is also lower than carbon-zinc batteries in heavy continuous use, but may be somewhat higher in light intermittent uses. In some cases, superior electrical device performance, resulting from the better shelf life and lower impedance of alkaline-manganese batteries, may offset any increased operating cost. At first glance a rechargeable power source appears to offer the convenience of primary battery operation without the expense of replacement batteries. In some circumstances, this could be true and a rechargeable battery the only economical portable power source. In other applications a casual appraisal may be completely misleading. A primary battery may be less expensive for both the short and long term as well as being more convenient. Consider the hypothetical case of two men who buy identical portable radios, operated by four penlite cells. Mr. A is a machinist working in a noisy shop. He operates his radio ten hours a day at high volume (45 ma. battery drain) so it can be heard above the ambient noise. Mr. B uses his radio an hour a day at low volume (15 ma. battery drain) in a quiet home. The radios can operate on any of the several types of primary batteries (assume No. 1015 radio grade carbon-zinc cells @ $1.00 per set of four) or nickel-cadmium cells can be used (No. N46 @ $11.00 per set of four plus approximately $7.00 for a charger). Mr. A can buy nickel-cadmium cells and a charger, re-charge them every night and recover his investment (compared to primary battery operation) in from 2 1/2 to 3 months. A good investment. On the same basis Mr. B would have to remember to charge his batteries once a month and would require six years to recover his investment-and by that time he might well need new nickel-cadmium batteries because they do not last forever. Obviously a poor investment. Sealed nickel-cadmium batteries are a fine product but they should be used only where primary batteries are uneconomical or impractical. For use in electronic equipment, any rechargeable battery should be hermetically sealed so that it is not necessary to add water and so that gassing on overcharge cannot carry corrosive vapor into the instrument. Also, the battery should be undamaged by long periods of storage, charged or discharged, and should have a low self-discharge rate. Sealed nickel-cadmium batteries meet these requirements best. Fig. 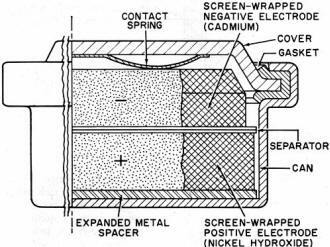 3 - Illustration above shows a cut-away view of a typical sealed nickel-cadmium button cell that is described in the text. The nickel-cadmium battery is a remarkable device and more than fifty years of successful use have proved this point. Nickel-cadmium batteries may be recharged many times, have a relatively constant potential during discharge, and have excellent charge-retention properties. They will stand more abuse than any other cell, have good low-temperature performance characteristics, and are competitive with other systems in terms of cost-per-hour use. They are true storage batteries using one of the very best electrochemical systems. The nickel-cadmium cell has been used in Europe for many years in its original form as an unsealed cell, for automobile and truck starting and for fixed installations. Recent technological advances have made possible the extension of the nickel-cadmium system to small, hermetically sealed batteries - rechargeable batteries that are free from the usual routine maintenance, such as the addition of water. These developments have brought the economic advantages of re-chargeability to small batteries. 1. The battery is constructed with excess ampere-hour capacity in the cadmium electrode. 2. Starting with both electrodes in the fully discharged state, charging the battery causes the positive (nickel) electrode to reach full charge first and it starts oxygen generation. Since the negative (cadmium) electrode has not yet reached full charge it cannot cause hydrogen to be generated. 3. The cell is designed so that the oxygen formed can reach the surface of the metallic cadmium electrode where it reacts, forming electrochemical equivalents of cadmium oxide. 4. Thus, in overcharge, the cadmium electrode is oxidized at a rate just sufficient to offset input energy, keeping the cell in equilibrium at full charge. Fig. 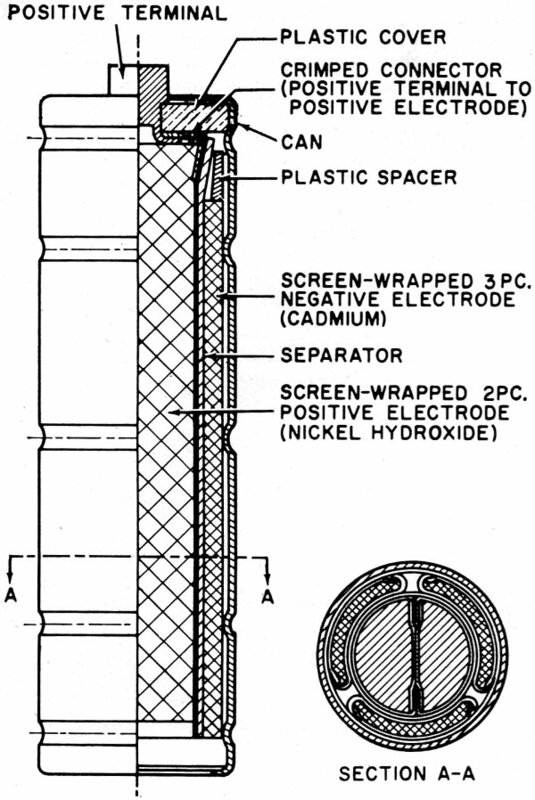 4 - Cut-away view of a cylindrical nickel-cadmium cell. This process can continue for long periods. The level of oxygen pressure thus established in the cell is' determined by the charge rate used. 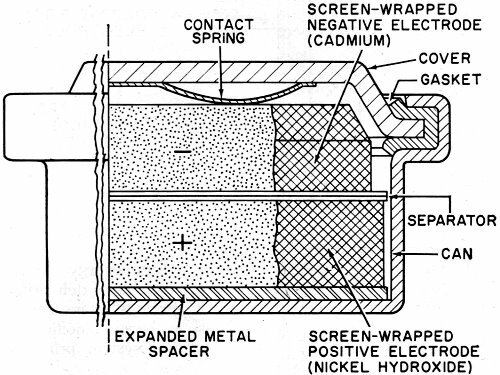 Sealed nickel-cadmium cells are available in a variety of sizes and capacities. See Figs. 3 and 4. These include: button cells (50-500 ma.-hour capacity), cylindrical cells (450-2000 ma.-hour capacity), and rectangular cells (2-23 ampere-hour capacity). The capacity of most nickel-cadmium cells is specified at the 10-hour rate (current drain required to discharge the cell in 10 hours). When they are used at higher discharge rates, the capacity is reduced. Nickel-cadmium cells have the desirable flat discharge (constant-voltage) characteristic. As shown in Fig. 5, note that the average voltage is about 1.2 volts per cell. The initial voltage shown on the curves is designated as the voltage under load after 10 per-cent of the ampere-hour capacity has been removed from a fully charged cell. Any rechargeable battery will lose charge when stored. Nickel-cadmium batteries have a lower self-discharge rate than any other present secondary battery system. More important, the batteries are not harmed even if not used for long periods of time. Sealed nickel-cadmium cells experience a relatively small loss of capacity at operating temperatures, ranging from -20 to +45 degrees C. Within this range, stable discharge voltage is maintained. Fig. 5 - Typical discharge voltages at various drains for sealed nickel-cadmium cells. With most nickel-cadmium cells, the 10-hour rate should not be exceeded in constant-current charging. Fourteen hours charging at this rate will fully charge the cell. Constant-voltage charging, which is also acceptable, results in a higher initial charging rate. At the start of charge the current may greatly exceed the 10-hour rate, but the charging circuit must be designed so that 10-hour current (or less) flows toward the end of charge. The battery can be trickle-charged or floated. For maximum performance in situations of continuous overcharge, with occasional interruptions, the current should not exceed the 30-hour rate. These cells will also stand extended overcharge at rates considerably higher than those recommended for floating. Although charging at the maximum rate (10 hours) is normally expected to be completed in 14 hours, cells will not be damaged by occasional charging at this rate even for several weeks. Continuous overcharging at higher-than-necessary rates accelerates general degradation of the cell but complete or sudden destruction will not result unless the 0-hour rate is exceeded. A typical, yet simple, charging circuit is shown in Fig. 6. Values of charging current for button and cylindrical cells range from 5 to 150 ma., depending on cell size, for a 14-hour charge. When used in an appropriate application where true advantage can be taken of their simplicity and rechargeability, sealed nickel-cadmium batteries can make possible new battery-operated devices which would otherwise be completely uneconomical. Fig. 6 - Charging circuit for small sealed nickel-cadmium batteries. Is the present multiplicity of batteries worthwhile? Has there been any real progress? The answer is an unqualified "yes." New battery systems supplement existing batteries. They improve the operation of many present devices, make possible new uses, and offer the consumer new choices so that he can obtain the best battery buy for his particular device and operating requirements. Battery and portable-power research and development continue unabated. Future years will bring still better primary and rechargeable batteries and probably fuel cells and thermo-electric generators as well. Thus more new devices will be able to operate electrically without being tied to a power line.